I see a hierarchy of criteria here. For the purposes of my own collection, I need at least one stamp from each country, and then I like a representative sampling of major periods in its history. I. Changes in a country that shape whether it is a priority to seek out stamps from each version. ... and major name changes make it a separate country for my purposes. For me, a major name change does not necessarily indicate a separate "country". If the country just changes the name for reasons unrelated to a change in border or controlling government, then I personally don't count them as separate. Independent Ceylon to Sri Lanka - In 1972 the country did move from a Dominion to a Republic, still within the British Commonwealth, but changed its name to move away from it's colonial roots. There was no real other changes of control within the country. Persia to Iran - In 1959, the country called Persia by the western world, officially changed it's name to Iran to reflect what the country was called by its local population. There was no real change in the country rather than official name. Siam to Thailand - In 1939, the country changed it's name to Thailand "Land of the Free" to reflect a move to democracy several years earlier. It wasn't fully accepted until 1949, after the end of the war. I think each combination does count as a separate country for my collecting purposes. Similarly, I have sought out each of the combinations of Rhodesia and Nyasaland. French Africa is one of my collecting foci, so I also take it to the next level and care about when each colony was on which side of WWII, and when they were aggregated into the AOF and AEF. I don't get the impression though that the difference between U-S-C and U-S + C mattered in terms of French bureaucracy and local impact significantly more than, say, the difference between French Madagascar alone and Madagascar combined with dependencies such as the Comoros. Yet, for the sake of collecting from each country, I don't need stamps from each version of Madagascar. One ares that is especially complex is that of present-day Djibouti. Significant differences: Obock, Djibouti, Cote Francais des Somalis/French Somaliland, Afars et Issas,and Republic of Djibouti. Minor distinctions: Prewar, the Petain issues (though not actually sent to the colony, if I recall correctly), France Libre, and then the topical packet trade era where my interest wanes. To help me better understand how "countries" transition within a particular region, I am developing "Regional Transition Charts". The purpose of these charts is to study the history of a region and try to sort out the "parents" and "children" of the various entities which issued stamps or banknotes (plus a few that didn't) within that area. So far I have done 17 charts, you can find them HERE; someday I will complete at least all of the complicated regions of the world. While I haven't done anything in French Africa yet, you mentioned Rhodesia and Nyasaland. Here is my Regional Transition Chart for Rhodesia / Nyasaland. 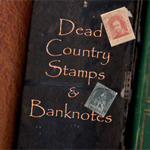 Dcstamps, your damn country transition charts have forced me to develop my wantlists enough to make some stamp dealers happy. When you get to French Africa, you might want to reserve some ibuprofen for the inevitable headache that French West Africa might cause. Old maps of Africa show the shifting borders as France kept revising its demarcations of patches of sand. That transition chart is amazing! I'm very impressed! Have you done these for a large amount of the dead countries you collect? Do you have charts for what became Australia, India, and Germany? My winter project has been to organize my Russia Area stamps, and as you can see, the area was so complex I had to break it up into four separate areas. (5 if you count the Baltics). South Africa was also particularly complex. Still working through my Russian stamps, so I haven't yet decided where to go next. (India, China and Central Europe are my biggest nightmares). A couple of comments on putting together the Regional Transition Charts covered above. As mentioned previously, I wanted some sort of definition of when a "country" started and when it ended. There are some complexities, as sometimes the start of a new "country" doesn't necessarily "end" the previous "country". Thinking about it can sometimes be enough to drive you to drink. Major changes in colonies/territories/provinces etc. 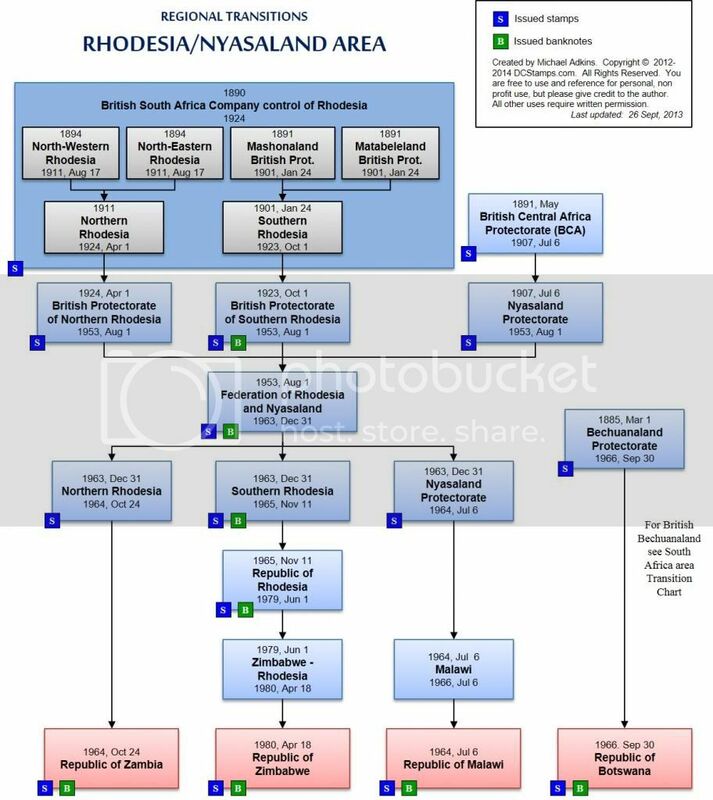 which expand, shrink, or combine them to form a new distinct entity - examples include the British colony of Lagos, French Cochin China, Nova Scotia, Nyassa Company or Zululand. Failure or end of a revolutionary entity - examples include the General Wrangel's White Army in South Russia, the Theriso revolution in Crete, or the Carlist revolution in Spain. There are obviously many other situations, but these are probably the most prevalent. Would love to hear any additions or comments from others! Next I would like to discuss some of the different types or categories of dead "countries". Entities such as a former Empire, Puppet State, League of Nation Mandate or Colony could be considered different categories of dead countries. All of these had somewhat different "legal" classifications from an international standpoint. One such category is Military Occupations. Essentially it is an area/country/region which is occupied (and often administered) by a foreign military. These issues have the distinction of being the first military occupation stamps ever issued. These stamps were issued for use by the Allied forces as they invaded Sicily, but was also used for private correspondence within the island. Their last day of validity was Sep 30, 1944. In 1881, Chile went to war against Peru and Bolivia over minerals in the region. After the occupation of Lima, the Chilean controlled government overprinted regular stamp issues of Peru with the arms of Chile, a shield with a white star, surrounded by a wreath below, and topped with three feather plumes (often described erroneously as a eagle). Last Chance before I move on, anybody have any occupation stamps to share? Would love to see them!! I am learning so much on this thread. Please keep going. I have been accumulating Japanese Occupation stamps (more or less passively, but occasionally actively) for a while now, but have yet to try to get them organized and ready for display. Someday I hope to be able to share them, but, in the meantime, I'll keep enjoying yours! I have some here and there, but most are not organised into anything useful... yet. I do have one comment on your site. The Canada page has a date error. You show the date for the ending of the Province of Canada as 1 July 1873... it ended 1 July 1867. It so happens that I just pushed myself away from sorting a bunch of stamps where the last couple left over in the pile caught me off-guard so I thought I'd take a look in Stamp Bears to clear my head. Lo and behold, here is a comment asking to see them. Here I thought I had an Italy Scott number 503. It wasn't until after I did a scan (I usually scan only those stamps with a real interesting design or with a decent CV) that I noticed the A.M.G.-F.T.T. overprint underneath the cancelation. The original Scott 503 was issued by the Republic of Italy on 3 May 1948 along with eleven other stamps (Scott 495-506) commemorating the centenary of the "Risorgimento", the uprisings of 1848-49 which let to Italian unification. 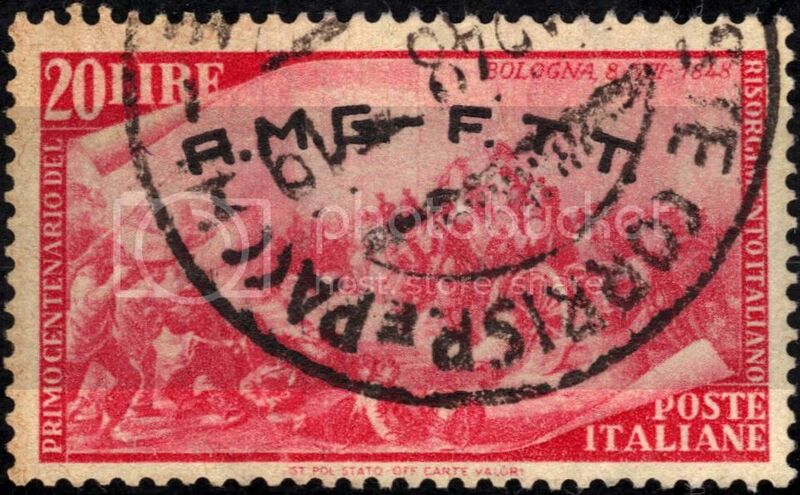 Pictured on this photogravure carmine rose 20-lira stamp is the depiction of the insurrection at Bologna. 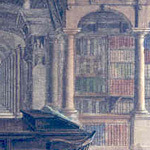 This whole set is printed on paper with the winged wheel watermark and all of them are perforated 14. It took almost two months before the A.M.G.-F.T.T. (Allied Military Government - Free Territory of Trieste) overprint to be applied on the dozen "Risorgimento" stamps (Scott 18-29); 1 July 1948. The Free Territory of Trieste existed between 10 February 1947 through 5 October 1954 when Zone A reunited with the Republic of Italy and Zone B ended up with Yugoslavia. Oh, and by my almost overlooking the overprint -- the CV with the overprint more than doubles the stamp without. The other stamp had an easily seen overprint, but the design had me a tad baffled. On 16 September 1950 three photogravure stamps (Scott 85-87) were issued in the Free Territory of Trieste to publicize the European Tobacco Conference being held in Rome that year. 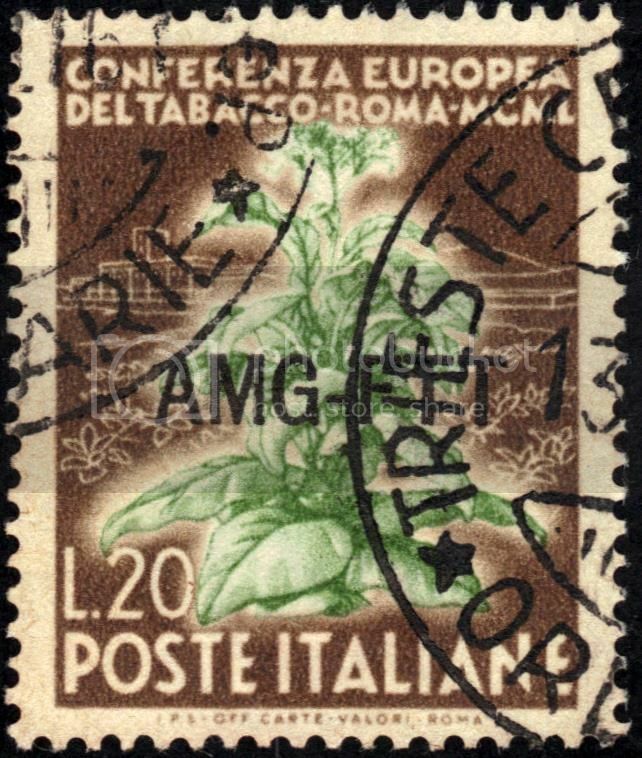 This 20-lira brown stamp shows a mature tobacco plant. The claret colored five-lira stamp has a younger-looking plant and the deep ultramarine 55-lira stamp has a girl holding a tobacco plant. All three stamps are watermarked with the winged wheel and perforated 14. The overprint was applied only five days after the original three stamps (Scott 544-546) were issued by the Republic of Italy on 11 September 1950. Without the scan the tobacco plant is hard to recognize from a green blobby cloud. The scan makes it much more identifiable. Thank you very much for catching the typo. I have made the change.